When an auditor arrives on-site and you aren’t prepared, it could result in a number of consequences, including paying fines, dealing with legal issues, and spending money on damage control. Ultimately, it could even bring your business to a standstill as employees are taken away from their work in order to go back to the paperwork. Having an IT partner in place ensures you’ll be fully prepared when audit time comes. Your IT partner will have your back, and will have both physical and digital paperwork that’s easy to understand and share with auditors seamlessly. Being audited isn’t a matter of if, but when, it will happen. Any number of corporate and regulatory entities can audit your company at a moment’s notice. Will you be ready when that time comes? According to 2013 research by IDG Research Services, less than 1 in 10 businesses feel extremely well prepared for a potential audit, while 47% feel somewhat to not at all prepared. While you can’t predict when an audit will happen, you can control your readiness for one. And while implementing processes that ensure your business is audit-proof can be a taxing and painful process, it doesn’t have to be. 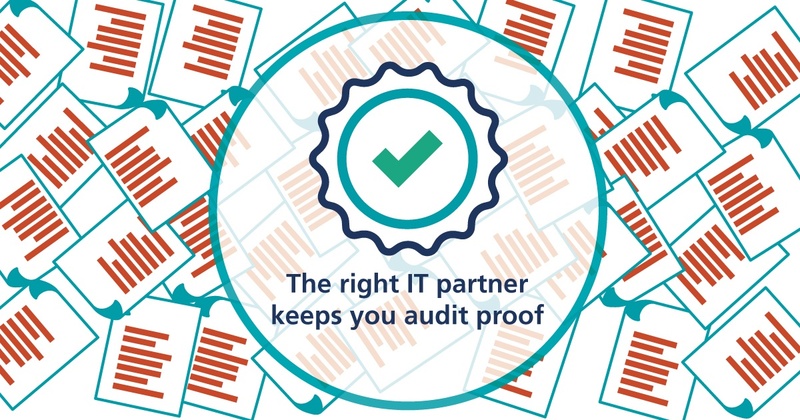 The right IT partner can help you meet compliance requirements and ensure that you have both physical and digital copies of the required audit paperwork. Does it help your bottom line to have your IT staff filling out paperwork instead of strategizing, testing, and implementing IT innovations that will drive your business forward? Probably not. Be prepared. Trust detail-oriented process experts with proven experience in highly regulated environments to keep you audit-proof. Industries like finance, data, and health, to name a few, have stringent corporate and regulatory compliance requirements. If you’re scaling your fintech enterprise, for example, do you have the luxury of spending time wading through the regulatory arrangements of over a half dozen federal interests? Find an IT partner that has successfully worked in those types of environments. Your IT partner will also prevent security risks by maintaining hardware and software and keeping an open line of communication with you about possible security risks. The recent Equifax data breach exposed sensitive personal information about 143 million Americans. Don’t let this happen to your company. The healthcare industry has strict privacy and security requirements enforced through HIPAA. Big data is a growing area in healthcare, an industry that has shown more resistance towards embracing technology. According to Healthcare IT News, “big data has gotten so big that some 41 percent of healthcare executives say the data volume their organization manages has increased by a whopping 50 percent just from a year ago.” The article also touches on a “lifetime’s worth of data” that needs to be protected. Understanding the increasingly complex daily cybersecurity risks, and acknowledging that your company could be audited at any time, can lead to constant stress. Finding the right IT partner means not even having to think about compliance. With an ideal IT partner, you’re fully in control of your business’ future.